The talk on one of the golf forums I tend to frequent yesterday had a lot to do with just what Jason Gore was putting with during the Arnold Palmer Invitational this week. Some people thought it to be a bit obnoxious with poor sight lines. I guess people have their opinions but it can't be all that bad as Gore is 2nd to Sean O'Hair after two rounds 3 shots off the lead. He's a T9 when it comes to putts per round and 3rd in putts per GIR. I'm also thinking there might be a few Scotty Cameron haters on the forum. 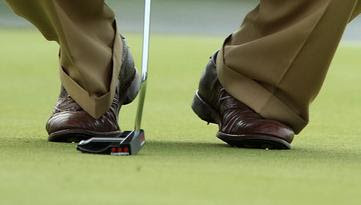 The putter Gore is using is a Tour Studio Select Kombi. In my opinion is in a nice black finish that hopefully comes to retail Scotties. Considering all the different styles of putters out there this one seems OK in my books would definitely like to try one out. I'm pretty sure Jason is liking it as well.